The most spacious light monoturbine on the market. Be amazed with the 505 Jet Ranger X, one of the latest models launched by Bell that has already taken the world by storm. 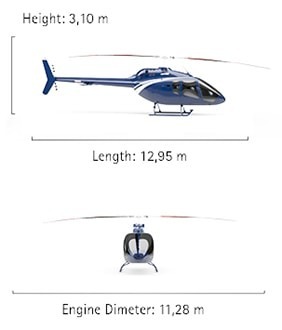 The helicopter combines state-of-the-art technology, high performance, and the best interior space in the category, resulting in a unique product, ideal for those who will not compromise comfort even with an increasingly fast routine. Completely flat floor and wide doors facilitate access of cargo and passengers, and the seats are easily removed or folded to adapt the aircraft to any mission. With the Bell 505 Jet Ranger X, the possibilities are truly vast. Designed to deliver the best performance in the category, the Bell 505 Jet Ranger X is equipped with a Turbomeca Arrius 2R engine and a dual channel FADEC system, which provide the aircraft with 504 shp of power at takeoff and speed of over 120 knots. The model has numerous features that increase the safety of operation, including HTAWS (ground warning system), digital aeronautical charts and synthetic vision (optional), as well as anti-crash seats. Complete and contemporary, the Bell 505 Jet Ranger X features advanced flight technology systems, especially the Garmin G1000H avionics, fully integrated into two 10.4" LCD screens. On the outside, the model is striking with its well defined lines and curves. On the inside, the size of the main window is impressive, providing excellent visibility to pilots and passengers. The Bell 505 Jet Ranger X is capable of comfortably accommodating up to five people, along with an exquisite interior finish, of course. 2 MTOW, Sea Level, ISA.